At first it seemed like any other time when Debra Buell used a county public bus. When the bus arrived the driver used the special lift to get her and her power wheelchair on board. Then he secured the wheelchair. This takes time. But two women sitting in the front of the bus were annoyed. Apparently it was a life-or-death situation for them to be somewhere else without any delay. Debra tried to ignore the women and their rude comments. But the women kept on, saying that people like Debra should just use the special paratransit service. After all, they thought, only the able bodied should ride on the regular bus. Without catering to someone in a wheelchair the bus would run on schedule. The women kept complaining when more time was taken to drop Debra off at her destination. 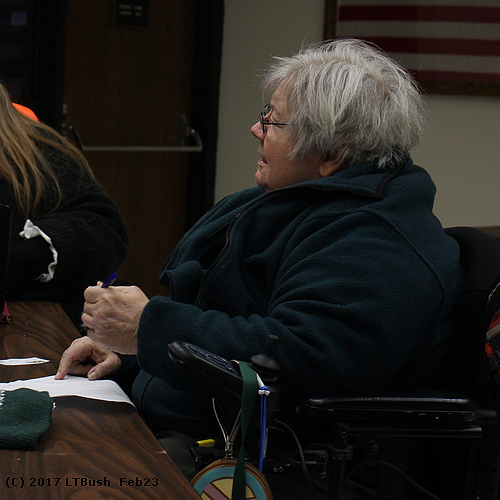 Debra shared this story today at a meeting of public officials and advocates for the disabled held at the Clinton County Government Center. She told her story without any anger or bitterness even though such feelings would be understandable. There was no justification for the two women to insult and debase someone deserving equal treatment. A selfish nasty person deserves an appropriate comeuppance. Poetic justice. Maybe a car accident or an incurable disease will disable both women. If not the aging process will bring about chronic infirmities. Walkers or wheelchairs should be waiting for them in the future. Limited mobility would force them to confront the same challenges people with disabilities face every day. and advocates for the disabled. Patti King was trapped in her home for two-and-a-half weeks. Why? Because someone didn't properly clear a wintry sidewalk. This morning Patti shared her story during a meeting of public officials and advocates for the disabled held at the Clinton County Government Center. Among the issues discussed was the topic of assessable routes. For decades the city has been pushing property owners clear snow from sidewalks adjacent to their properties. Most comply with the regulation but it only takes one to not to do his duty and an accident ensues especially when a pedestrian is forced to use the street. One time a Plattsburgh State college student was walking in the street due to a snow-blocked sidewalk. A car struck and killed her. And accidents can happen even when someone stays on the sidewalk. One slip: a broken leg or arm. Or in the case of Patti King, a damaged power wheelchair that she depends upon for mobility. She explained she was carefully moving along near the corner of North Catherine and Cornelia Streets, watching out for icy spots. Despite her caution her wheelchair slipped, crashing into an icy snowbank. The impact broke the fork holding one wheel and her chair was bent. Patti was able to get back home with her wheelchair scraping along. Power wheelchairs are more difficult to fix compared to manual ones. Without her means of mobility Patti was forced to stay home for days on end, unable to move or do anything for herself. Her wheelchair is only partially repaired. It might take up to three weeks to fix it. 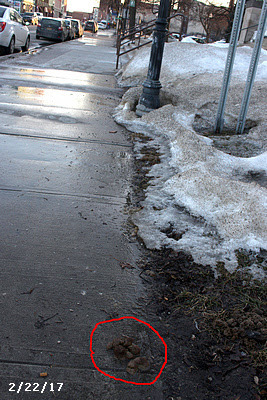 As a North Country Center for Independence board member she is more than aware of the wintry sidewalk problem. Then again for wheelchair users there are always problems even during the warm sunny weather. Years ago Patti had the right of way on a crosswalk and a driver clipped her wheelchair with his car. Advocates mentioned during the meeting that some in the disabled community stay home because routes are inaccessible, even dangerous. Essentially they're trapped. Revised 2/23/17 at 4:26 PM for accuracy. Besides BS you can also associate DS with Plattsburgh City Hall. As reported in a previous post dogshit was left on City Hall grounds. The problem hasn't been alleviated: it is being constantly refreshed as evinced by the accompanying photos. 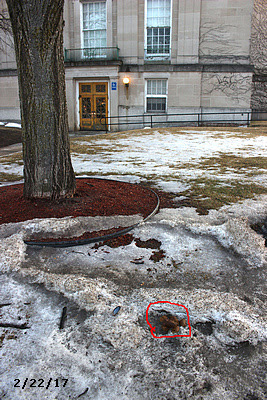 Someone is using City Hall lawns as part of a regular dog walk routine, meaning the culprit should be easy to catch. A perfect theme song for downtown is Slip Slidin' Away by Paul Simon. 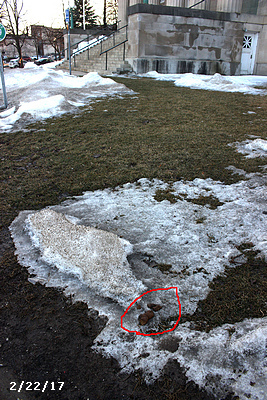 Snow and ice during the winter with unshoveled sidewalks and dogshit any time of the year. A scorpion needed help to cross a river. He asked a turtle if he could hitch a ride with him. 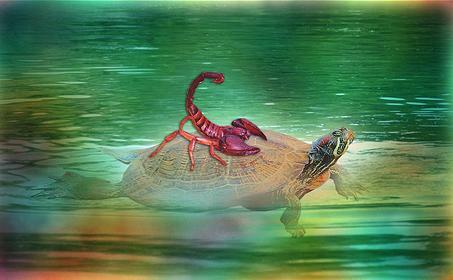 Seeing the scorpion’s logic the turtle allowed the scorpion to climb on his shell. Then he entered the water with his passenger and started to ferry the scorpion across the river. Halfway across – at the river’s deepest part – the turtle felt a paralyzing sting. 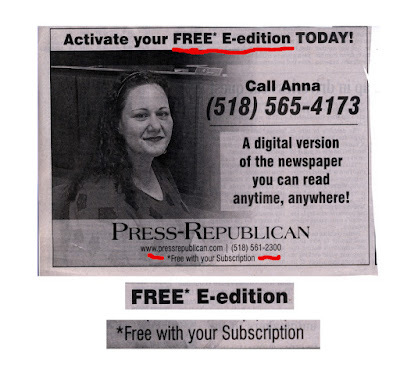 Always check for the qualifying asterisk.